Governor Winchester Colbert was the youngest son born into the Levi Colbert family in 1810, and he grew up on the lands of the old Chickasaw Nation. The young Chickasaw became fluent in English, Chickasaw and Choctaw, which served him well during his successful career in politics. Colbert got his start in Washington, D.C., working with Thomas L. McKenney, who served as a historian and Indian Commissioner during John Quincy Adams’ presidency. 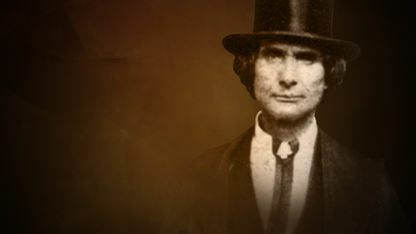 McKenney acted as mentor to Colbert, teaching him a multitude of skills that would benefit other Chickasaws upon Colbert’s return and eventual move to Indian Territory in 1837. After relocating to Indian Territory, Colbert worked tirelessly as a diplomat to establish the Chickasaw tribe’s sovereignty. He was passionate about restoring and formally separating the Chickasaws from the Choctaw Nation. After much writing, speaking and negotiating, Colbert finally attained his goal and received a response 18 years later. Thanks to Colbert, a treaty on June 2, 1855 reestablished the Chickasaw Nation as its own nation and political identity. This treaty, guided by Colbert, also established the territory and borders of the Chickasaw Nation. Colbert later went on to serve as a member of the first Chickasaw Legislature in 1856, and he was elected the second governor of the Chickasaw Nation in 1858. He served as governor for three terms. The diplomat and Chickasaw leader passed away in 1880 at the age of 70.